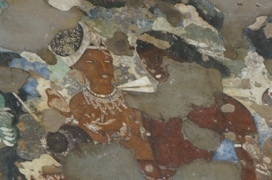 The next day is Tuesday, and Ajanta is open to the public again. It’s a little more than rickshaw-distance, at 100km from Aurangabad, but (surprise surprise) Aman knows a guy with a car, so for INR1850 Alizé and I are collected to be collected from our respective hotels at 8:30am to begin the journey. I’d had a useful discussion with the waiter in the hotel cafe at breakfast the day before about transport options and timing and so on, and he’d been teasing me for going with the safe breakfast option of a masala omelette (omelette with green chillies and red peppers). I’d promised to try the Indian breakfast the next day so, with a wide smile, this morning he serves up a large plate of poha, pre-cooked, pounded rice that has been reheated and mixed with spices and roasted peanuts – flavoursome but mild enough not to shock my western palate too early in the morning. Breakfast over, I have a brief “discussion” with the young kid on reception who is unwilling to let me go without paying for my room, despite my assurance that I’ve paid in advance. We compromise: I leave my luggage hostage and promise to return after Ajanta if he will let me use a shower when I come back, and I call on the ever-helpful Aaliyah at India Someday, who promises to have the matter sorted by the time I return – which she does. They have sometimes been slow to respond prior to the trip, but since my arrival in India we have been in regular contact and nothing is too much trouble. As a trip booking service they are well worth the small fee for their in-country support. Here endeth the endorsement. There is no sign of Aman this morning, but he has sent his cousin (brother, colleague, partner in crime – who knows! ), a man called Samir. His English is not as good as Aman’s, but he knows this route well and points out sights along the way. 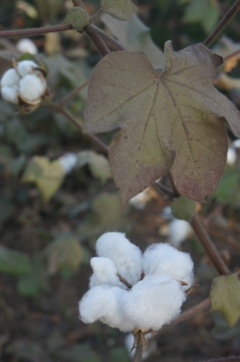 It is the first time that I have seen cotton fields, and Samir stops the car so that we can take a closer look. 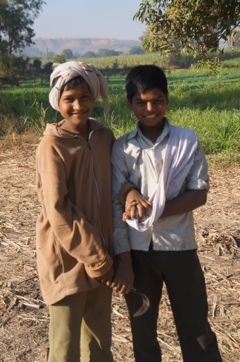 Two young boys, maybe 12 years old at most, come running up, eager to show us the flowers on the cotton plants, and some tiny buds on the mango tree nearby (doomed never to make it into mangoes since, in their enthusiasm, they pull out a small scythe and cut them from the tree to present to us). The boys ham it up for the camera, pretending to attack each other with the little scythes, like boys of their age anywhere, except that these two are field workers, and will go back to picking cotton when we are gone. There are other workers in the nearby fields, cotton, corn, wheat and sugarcane, and further along we see makeshift tents, some with rope and tarpaulin, others using sticks and cornstalks. They are the camps of itinerant workers, who travel from farm to farm and camp in the fields where they work. Later in the day we pass such a group in a train of rickety wooden ox-carts. The animals hauling the carts seem immune to the faster traffic rushing close by them. About 20km before Ajanta we stop at a roadside cafe for chai and pakoras (or coke for me, I still can’t be dealing with that milky tea). Our Nepalese friends from the day before are at the next table, and we nod and smile in recognition. Our driver Samir introduces us to a couple of friends of his, one who runs a small Indian restaurant in Frankfurt but travels back to India for the winter months, and another, who calls himself Jack, and says he is a businessman, with a small shop at the shopping complex at Ajanta. We talk about the caves, and Jack mentions the alternative entrance – would we like to go that way? He would be happy to be our guide (you can see what’s coming here, right?)…. As it happens, the alternative route is exactly the one I was hoping to take. 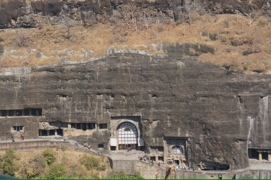 Ajanta means ‘forgotten’ or ‘lost’ and, after they were abandoned by the Buddhist monks who built them, the caves were indeed forgotten for centuries, until a group of Englishmen happened to be out hunting for tigers one day, and spotted the caves from a nearby ridge. They alerted the local Nawab, and the caves eventually became a tourist attraction – right down to the recently-built government shopping complex at the main entrance, a short bus ride from the caves themselves, which, Jack tells us, has been funded by the Japanese. The original point where John Smith rediscovered the caves is one of only a couple of viewpoints where the entire horse-shoe of the caves can be seen, and it’s a steep climb up from the caves themselves. Instead, we take a narrow country road through a poor village (in the midst of which, bizarrely, is a tin fairground carousel), and Samir drops us at the top of the hill, at the official lookout point which marks the place of discovery. Jack leads us down the side of the cliff along a narrow path. We veer off the path to see a waterfall – or what would be a truly impressive waterfall post-monsoon, if any of the seven descending pools carved out of the stone had enough water to overflow. This is a popular (but dangerous) swimming spot for the locals. 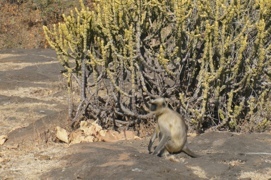 Just as we are about to return to the path, there is movement under a nearby cactus, and a family of monkeys emerge, glance at us scathingly, and move on. At the entry to the caves below, Jack offers to wait for us – we assure him that won’t be necessary. We have agreed to visit his shop after we leave the caves, warning him in advance that we have no money (yep, I saw it coming too, but I’m fairly confident in my ability to stick to window shopping, and I’m quietly enjoying watching the Great Indian Scam attempt to unfold – it’s all part of the experience!). On the way down the cliff path he has told us all about the years he spent in Goa, and his English girlfriend of two years, who returned to Manchester and won’t take his calls. He blames her mother, who clearly didn’t like him. I suspect the discovery that he has a wife and children may have been more of a clincher. We make sympathetic noises and then change the subject. At last we reach the first cave. 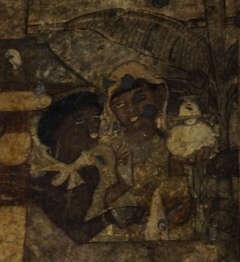 The Ajanta caves are entirely Buddhist, and the main difference between these and their counterparts in Ellora is the elaborate cave paintings that have been preserved here. After yesterday I am determined to hire a guide so that I understand a little better what I am looking at. He takes us to 8 of the 32 caves (a number are closed for restoration, others have very little inside, are identical to the others, or are shallow enough to be seen from the main path without further explanation) – we can wander through the rest at our leisure. 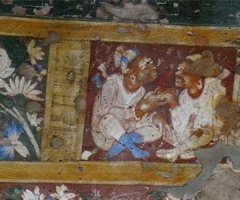 The detail of the paintings is amazing (the guide has a superpowered torch that puts my little headlamp to shame), and the clothing, jewellery and tools depicted give an insight into Indian society at the time. 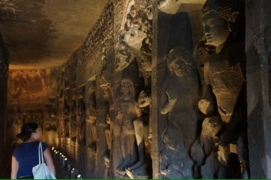 The rest of the caves contain sculptures, including a giant reclining Buddha, and a cathedral with arched beams carved from the stone. 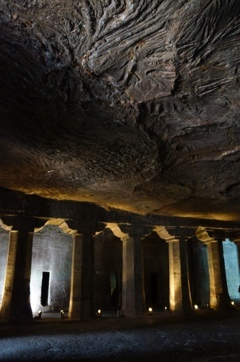 The stone is volcanic, and in one cave the original ceiling has fallen away, revealing the frozen lava flow above. I’m again amazed that all of this has been accomplished with the use of hand tools – it’s not surprising that it took hundreds of years to complete, but to have created all of this only to abandon it again (our guide speculates that the occupants moved north with the decline of Buddhism in India – which may go to explain the Nepalese pilgrims). We at last emerge and pay our 12 rupees for the air conditioned bus to take us the 15 minute drive to the main exit, where our driver is waiting (well worth the extra 5 rupees over the non-aircon version). And sure enough there is Jack, with his shop, which turns out to be full of crystals and sculptures of Buddha – he is only mildly offended when I suggest they have been imported from China. 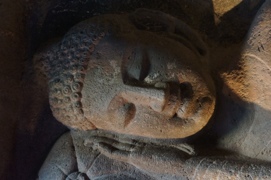 In a fit of generosity I pay a third of the original asking price for a tiny basalt carved Buddha, which I would likely have bought from another shop anyway – it’s easy enough to refuse anything else, it simply won’t fit in my pack! Most effective shopping deterrent ever. Samir has one last attempt at the hard sell – this area is famous for its silk and cotton weaving (himroo and paithan), would we like to see a museum? The museum becomes a factory, and then a showroom, and ultimately turns out to be a shop, run by a fellow who looks an awful lot like Samir. We profess our complete disinterest, but he is very keen for us to go in – “just looking is ok”. So we just look, and 2 minutes later are back in the car again, much to Samir’s surprise – there are no more attempts at further stops! On reaching the hotel, we decide to have dinner together before I catch my train. The hotel restaurant is closed, and directs us instead to an “Italian” place down the road, but before we leave Samir runs up and asks us to wait, as Aman is on his way. We had arranged for him to drop me at the station a little later on, so we can’t work out why Samir is so insistent, until Aman finally pulls up – in his Sunday finest, and riding a shiny Royal Enfield motorbike. Classic. It seems rude not to, so we invite him to join us for dinner (an odd Indian version of Italian, with extra spice, and a whole separate “Chinese” menu which includes gyoza) and Alizé is delighted when he agrees to drop her back to her hotel on the back of the bike (and promptly decides to spend her remaining day in Aurangabad sightseeing by motorbike). Aman returns with his rickshaw to drop me at the station for my first overnight train journey. But you’ve heard about that already (see my tired rant a couple of posts back). *ok, I might have made that one up. But there was a set of Auckland rugby socks up there, honest!